Helicobacter pylori (H. pylori) is a spiral-shaped gram-negative aerobic bacterium that grows in the digestive tract and has a tendency to infect the stomach. Bacteria play a vital role in balancing the stomach ecology. When H. pylori invades and attacks the stomach lining, it causes stomach infections. These infections can lead to peptic ulcers and gastritis. They are also associated with stomach, duodenal, and gastric cancers. These infections are commonly found in both men as well as women. Over 50% of the world’s population is infected by H. pylori. In some countries, the prevalence of H. pylori is higher than 80%, making this infection one of the most common bacterial infections. In 1994, the WHO’s, International Agency for Research on Cancer classified H. pylori as a Class 1 carcinogen. The global Helicobacter pylori (H. pylori) non-invasive testing market was valued at US$ 518.0 Mn in 2017 and is estimated to reach a value of US$ 731.9 Mn by 2026, expanding at a CAGR of 3.99% during the forecast period. Most people infected with Helicobacter pylori bacteria are unaware that they have been infected as the infection is mostly asymptomatic. Children are more susceptible to H. pylori infections. Patients suffering from peptic ulcers that are caused by H. pylori experience symptoms such as vomiting, abdominal pain, nausea, loss of appetite, and excessive burping. In some cases, peptic ulcers lead to severe complications such as obstruction in the stomach lining, internal bleeding, or perforation. High prevalence rates of H. pylori bacteria are projected to propel the global Helicobacter pylori (H. pylori) non-invasive testing market during the forecast period. Developing countries reflect a higher prevalence percentage of H. pylori. Poor sanitation, lack of potable water supply, poor food hygiene, poor personal hygiene, and overcrowding are some of the key factors attributed to the spread of H. pylori infections. Rise in awareness regarding this infection among the global population is one of the factors propelling the expansion of the helicobacter pylori (H. pylori) non-invasive testing market. However, low diagnosis rates even in high prevalence geographies, asymptomatic nature of the infection, and stringent regulatory norms are expected to hamper the market. The global helicobacter pylori (h. pylori) non-invasive testing market can be segmented based on test type, test method, end-user, and region. In terms of test type, the market can be classified into serology test, stool antigen test (SAT), and urea breath test (UBT). The serology test segment is expected to lose market share during the forecast. Although the serology test method is quick, easy, and cost effective compared to other tests, regional agencies such as the American Gastroenterology Association (AGA) and National Health Services (NHS) have updated their guidelines to recommend stopping the use of serology testing for the detection of H. pylori due to its inaccurate nature. The urea breath test segment is estimated to constitute a significant market share by the end of the forecast period owing to the test’s accuracy and growing availability. Based on test method, the market can be categorized into laboratory-based tests and point-of-care tests. The laboratory-based tests segment is expected to hold a dominant share by the end of 2026. In terms of end-user, the market can be classified into hospitals, clinics, and diagnostic laboratories. The diagnostic laboratories segment is anticipated to account for a major market share, followed by the hospitals segment. The rise in number of diagnostic laboratories can be attributed to a large number of tests being carried out in standalone and hospital-affiliated diagnostic laboratories owing to their ability to handle high volume of tests. In terms of region, the global helicobacter pylori (h. pylori) non-invasive testing market can be segmented into North America, Europe, Asia Pacific, Latin America, and Middle East & Africa. North America is expected to lead the global market in the 2018-2026 period. The expansion of the market in the region can be attributed to the presence of key players in the region and swift technological advancements in the field of helicobacter pylori (h. pylori) non-invasive testing. Europe is expected to hold a prominent market share during the forecast period. Key players operating in the global helicobacter pylori (h. pylori) non-invasive testing market are DiaSorin S.p.A., Meridian Bioscience, Inc., Exalenz Bioscience Ltd., Alere, Thermo Fisher Scientific, Biomerica, Inc., Certest Biotec S.L., Sekisui Diagnostics, CorisBioconcept SPRL, and Shenzhen Zhonghe Headway Bio-Sci & Tech Co., Ltd. This report studies the current as well as future prospects of the global Helicobacter pylori (H. pylori) non-invasive testing market. Over 50% of the world’s population is infected by H. pylori, and in some countries, the prevalence is higher than 80%. This is boosting the global Helicobacter pylori (H. pylori) non-invasive testing market. In 1994, the WHO’s, International Agency for Research on Cancer classified H. pylori as a Class 1 carcinogen. This report on the Helicobacter pylori (H. pylori) non-invasive testing market comprises an elaborate executive summary, which includes a market snapshot that provides information about various segments. It also provides information and data analysis of the global market with respect to segments based on test type, test method, end-user, and geography. A detailed qualitative analysis of drivers, restraints, and trends has been provided in the market dynamics section. Additionally, the report comprises a list of new non-invasive H. pylori test launches by market players. The report describes epidemiological assessment of Helicobacter pylori, key technological advancements in Helicobacter pylori diagnostic testing, and market outlook and Porter’s Five Forces. The report provides a competition matrix in terms of current and future market positioning of key market players and their key differential parameters to help understand the competition landscape of the market. This report also provides market attractiveness and its analysis, in terms of geography, as well as market share analysis by test type, by test method, and end-user. Thus, the report presents a thorough analysis of the overall competitive scenario in the global Helicobacter pylori (H. pylori) non-invasive testing market. Based on test type, the global Helicobacter pylori (H. pylori) non-invasive testing market has been segmented into serology test, stool antigen test (SAT), and urea breath test (UBT). The urea breath test (UBT) segment is expected to account for a prominent market share by the end of 2026, owing to factors such as rise in availability of the test, quick turnaround time for results of the test, and high accuracy rate for the detection of H. pylori infection. Among test methods, the laboratory-based tests segment held a prominent market share in 2017 and is expected to dominate the market during the forecast period, owing to the ability of the method to process large test volumes and trained professionals on site to carry out the tests in a controlled environment. In terms of end- user, the diagnostic laboratories segment is expected to hold a major market share fuelled by a large number of tests being carried out in standalone and hospital-affiliated diagnostic laboratories. The market size and forecast for each of these segments have been provided for the period from 2016 to 2026, along with their respective CAGRs for the forecast period (from 2018 to 2026), considering 2017 as the base year. In terms of region, the global Helicobacter pylori (H. pylori) non-invasive testing market has been categorized into five major regions and key countries in the respective regions: North America (the U.S. and Canada), Europe (the U.K., Germany, France, Spain, Italy, and Rest of Europe), Asia Pacific (India, China, Japan, Australia & New Zealand, and Rest of Asia Pacific), Latin America (Brazil, Mexico, and Rest of Latin America), and Middle East & Africa (South Africa, GCC, Israel, and Rest of Middle East & Africa). The market size and forecast for each of these regions and the mentioned countries have been provided for the period from 2016 to 2026, along with their respective CAGRs for the forecast period (from 2018 to 2026), considering 2017 as the base year. The research study also covers the competition scenario in these regions. 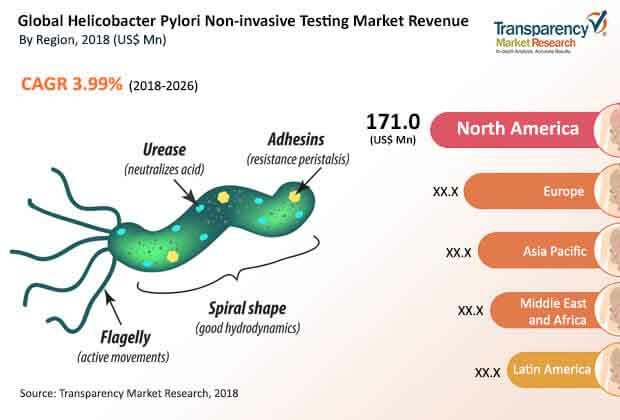 The report also profiles major players operating in the global Helicobacter pylori (H. pylori) non-invasive testing market based on various attributes such as company overview, financial overview, product portfolio, business strategies, SWOT analysis, and recent developments. Major players profiled in this report include DiaSorin S.p.A., Meridian Bioscience, Inc., Exalenz Bioscience Ltd., Alere, Thermo Fisher Scientific, Biomerica, Inc., Certest Biotec S.L., Sekisui Diagnostics, CorisBioconcept SPRL, and Shenzhen Zhonghe Headway Bio-Sci & Tech Co., Ltd.